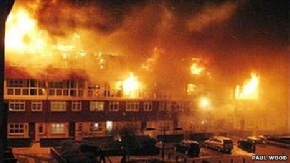 On average around 200 homes catch fire every day in the UK resulting in one death and 40 people being injured. 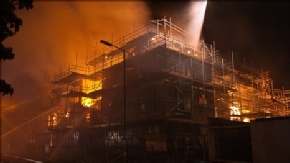 The UK Building Regulations state minimum fire resistance requirements for all new homes and buildings regardless of the materials used in construction. This minimum requirement being that the structure has to survive intact and prevent fire spread for approximately 30 minutes to enable the safe exit of people. Far exceeding this minimum, a masonry house built with concrete pre-cast floors offers over 4 hours of protection to its occupants. Unlike timber, masonry cannot burn. Even in the worst fire a masonry house or apartment block will maintain its structural integrity, with only the timber elements requiring replacing. Homes built using traditional construction protect against the spread of fire between rooms or properties, as masonry cannot catch fire, burn or drip molten particles. A timber frame home is in most cases totally destroyed. In answer to the question "Is a Timber frame house at more risk from fire?" the supporters of timber frame construction the UK Timber Frame Association, and manufactures reply: "Unlike other forms of construction, Timber Frame does not bend or flake when subject to high temperatures this allows for a slow and controlled loss of structural integrity which can make less likely to collapse and therefore safer than homes built using other methods." After the fire was extinguished at the building site in Basingstoke, all that remained was the tube scaffolding, the block-built lift shaft and some structural steel columns and beams which had supported the now totally destroyed timber floor. Would you rather be in a masonry new home or timber frame new home when the home next door is on fire? 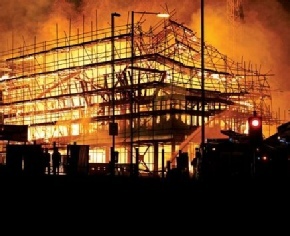 It is becoming more common for sprinkler systems to be specified and installed in new timber frame buildings, most notably nursing homes, as owners are all too aware of the consequences of a fire in a timber framed building.